These two cards feature a paper pad I purchased yesterday and am absolutely loving! The Love Notes paper pad from We R Memory Keepers is wonderful if you love watercolors or green, pink, and black. The colors in the paper are very vibrant and you can achieve very different looks with the variety of patterns included in the pad. These cards are very different from each other, even though I used the same template. For the scallop, I used my scallop circle dies from Sizzix and made sure to die cut a white border to go around the partial circle. I made the black card first, and while I loved how the heart stood out, I felt it needed some shine. 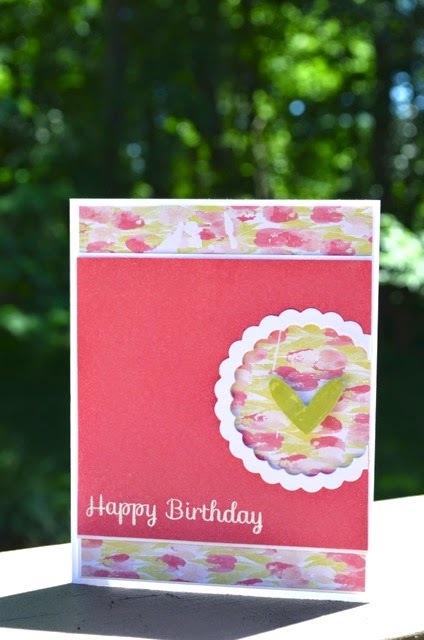 When I was making the second card, I made sure to emboss the lime green heart with my Versamark pad and clear embossing powder. 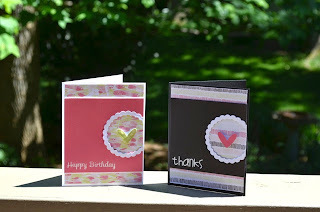 The happy birthday stamp is from SSS and the thanks is from Paper Smooches. Thanks for checking out these cards! In the coming days, I will be posting some more different looks from this paper pad. Get the WRMK Love Notes paper pad here!